Controlling your indoor grow while drinking a frappucino on the Red Square or while crashing a wedding in Las Vegas. Thanks to the monitoring and control systems of Motorleaf, wireless growing is now at everyone's green fingertips. When Ramen Dutta started his own indoor grow, he soon found it wasn't always easy to leave without damaging his plants. The McGill graduate with a degree in Agricultural Engineering therefore started to develop his own smart wireless control system to monitor and manage his crop from any place in the world. Realizing that his idea and prototype should be available to fellow growers, he teamed up with his friend Alastair Monk to co-found Motorleaf. One year later and several rounds of funding after completing the FounderFuel accelerator program, Motorleaf is offering a complete package of software and hardware solutions to automate farms in a swipe and a click. Their wireless system collects data, lets you remotely tweak your grow and help you to make better informed decisions. It's so smart that it can even analyze data and instruct your grow equipment without human interaction. "We focus on growers from zero to 1 acre. They are often not large enough to afford or install existing remotely accessible climate controls. With Motorleaf we can offer them an affordable solution that is easy to install and a pleasure to use", said Alastair Monk, CEO and Co-founder. According to Alastair , existing environmental controls in this space are usually designed for larger commercial greenhouses or plant factories. "Smaller, local urban farms and indoor grows lack a comfortable wireless solution. 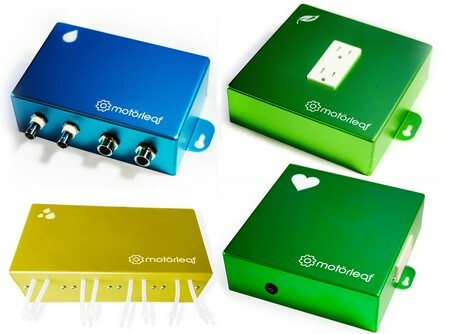 Motorleaf is designed to help them grow their plants and their business. It is a scalable Internet of Things solution that can be installed on top of these existing technologies AND for smaller size indoor farms. Simply plug in your irrigation, heating, and climate control equipment and get started." Motorleaf works online and offline. The center of the system is the 'Heart' unit. When connected to a router, it provides easy access to your most important parameters such as temperature, relative humidity, irrigation and other practical grow controls. Together with other Motorleaf hardware such as the Droplet, Driplet and Powerleaf, it allows you to take full control of your crop from anywhere, thanks to their web-based accessible software interface. But wait, there's more. Because what makes the system really interesting, is Mortorleaf's dedication to using and understanding data to its fullest potential. "The system is designed to help any size grower not only monitor, automate and control his operation, but also to give growers much better tools to make better decisions.Because besides all of the control functions and alerts, Motorleaf is able to predict plant growth and mitigate risk factors." Alastair said that this is the future for indoor farmers. "Artificial intelligence and machine learning is an important part of our mission. Farming is all about sensing and analyzing data, and computers are much better in managing this data than humans. With the right input and learning, a computer system can make far better calculations and data-driven decisions than only a grower. This is the approach we have when building our software, and we are convinced that this will help growers to achieve better results." Currently Motorleaf is investigating other implementations of AI, IoT and Machine Learning in their technology. The company is expanding its team and funding, and looks to increase its industry network with beneficial partnerships with other control and automation suppliers. An increasing amount of growers and indoor farms are successfully using their system; from a small scale cherry tomato greenhouse in Vermont to one of North America's largest glasshouse growers.